What do you get a 4 year old boy for Christmas or Birthdays? It’s a conundrum all parents, godparents, uncles and aunties all have from time to time. Well if you’re looking for the most ideal gift or toy for a 4 year old boy then your search may have just come to an end…thank goodness for that!!! 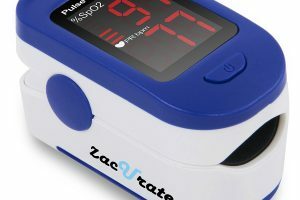 On Consumerexper.org we’ve got toys and gifts for 4 year old boys covered! 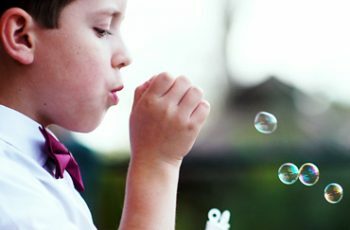 We have trailed the internet and hunted down the most ideal toys to suit a 4 year old boy’s current development stages within cognitive, emotional and social development areas. Your 4 year old boy, is no longer a toddler. He’s becoming more and more independent and craves new experiences when it comes to play. With their language skills becoming stronger and stronger each week and his problem solving skills starting to kick in, puzzles and other such types of toys would be beneficial to this age group of boys. 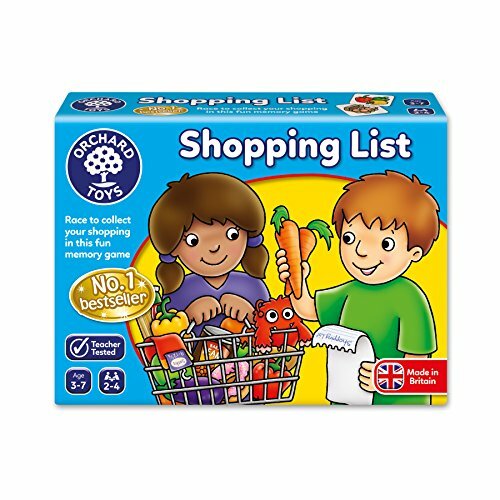 We have carefully collated the best gifts & toys for 4 year old boys and provided you with all the information you need to make the best possible purchase in order to help nurture their learning and development. 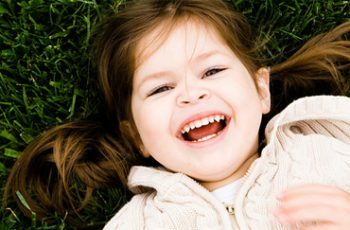 We do hope you enjoy our awesome list of suitable toys and gifts for a 4 year old boy. There’s nothing a 4 year old boy likes more than taking things apart and cars. Well this toy is just the perfect combination. This is the Take Apart Toy Racking Kit which not only entertains your 4 year old for hours on end, but also meets his development needs and gross motor skills. 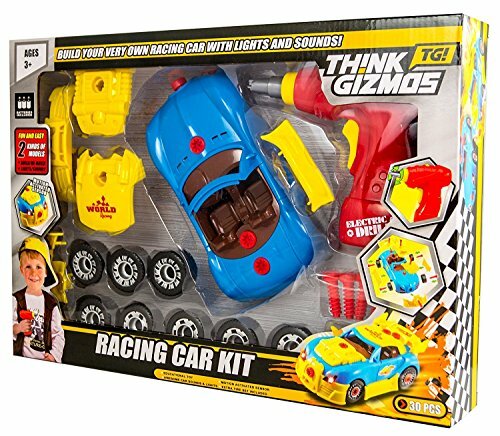 This is one of our favourite toys in all the guides we have created, because it’s really cheap, extremely good value for money, gives the child so much in terms of activities and developing their hand-eye coordination and at the end rewards the child with a car that they built all by themselves. It comes with 30+ car part pieces, a plastic drill and screws and car parts to enable your child to take it all apart, rebuild and customise. It will give them literally hours of endless fun. I’ve added this toy/gift in the 4 year old bracket because of the stage to where a 4 year old is at with his cognitive and motor skills development. At this age he will get so much benefit from taking the car apart and going through the rebuild process. 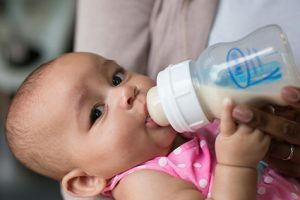 It will help to improve grip and coordination skills. The child will get great satisfaction once the car is built because it comes with working lights and sounds to enhance the driving role playing experience. This would also make a great gift for girls also. The Poco Divo is a three in one ride on toy for little boys. 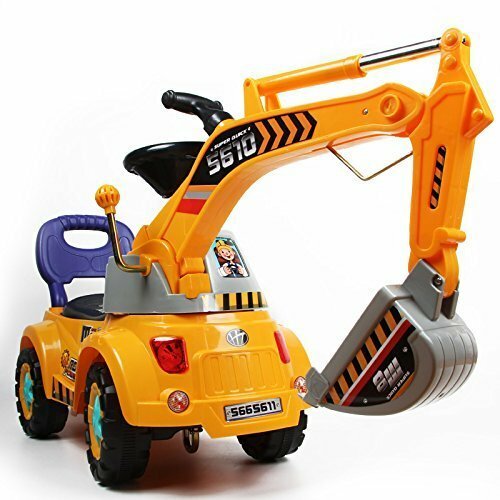 It features a rotation drivers cab and a handle to manipulate the digger arm. The steering wheel plays music and flashing lights. There’s storage space under the seat, and a rope can be attached to the bottom to convert it to a pulling cart. It comes with a three-piece gardening tool set. This type of toy helps to build gross motor skills as your child propels the scooter forward using his feet. It also teaches him to understand results as he manipulates the moving parts and stores or hides things in the compartment under the seat. Why he’ll flip: It’s a truck just like the ones he sees in real life, but this one is just his size. This memory game is a simple game to play. Remember what’s on the list and use it to remember when you’re at the “store.” The illustrations are bright and easy to understand so your child doesn’t have to be an expert reader to play. Games teach valuable social skills. He’ll get the chance to play with friends and family and hone those skills. It also helps him use his memory and get better at seeing details. The cards are high-quality stock and will withstand some wear and tear. Perfect for rambunctious boys. Why he’ll flip: Easy gameplay and bright illustrations will keep his interest as he practices social skills. This railway set is a great introduction into the world of trains. It features an easily assembled light and sounds train engine with two passenger cars with sliding doors, ticket kiosk and Metro map and two passengers. 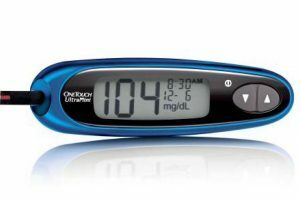 It has eight track sections that form into a circle and requires batteries which are included. He can imagine scenarios that take place on the metro, and all the pieces are comfortable to hold in small hands. 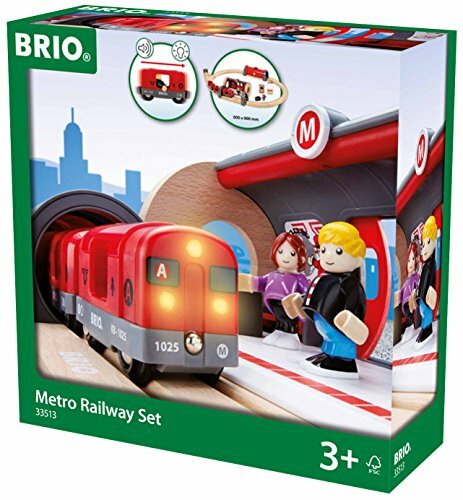 There are many opportunities for imaginative play, and this can connect to other Brio sets. Why he’ll flip: Working train, doors, and meticulous detail make this set feel real. 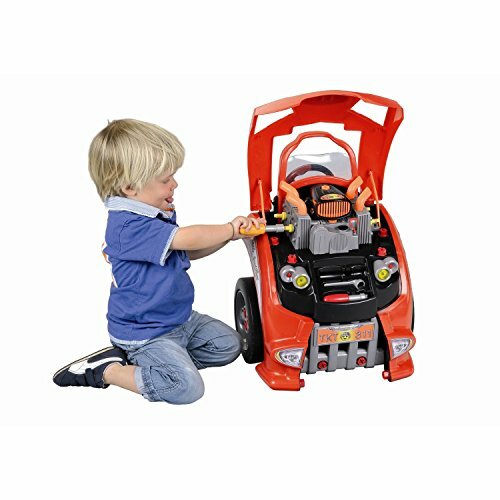 The service car toy allows your four-year-old to work on a car just like daddy. 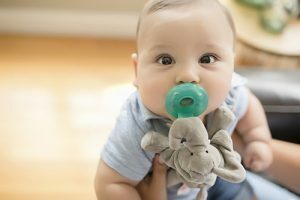 It’s a durable toy that will enable him to participate in dramatic play. He can check the oil and the air filters, test the brakes, and tinker with the engine. He can tune it up with the turn of a key. The engine makes realistic sounds so he can tinker or take it apart to make it run more smoothly. It includes a set of tools, and removable spark plugs, wingnuts, and tires. The headlights really work, and there are decorative decals. Why he’ll flip: This is probably the coolest mechanics toy around. There are so many pieces to tinker and play with that he’ll be busy for hours. This may seem like a simple toy, but in reality, the possibilities are endless. 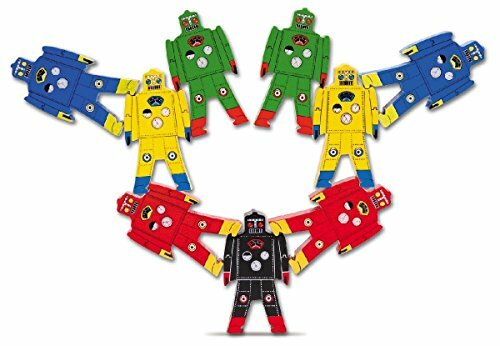 The wooden robots are designed to be linked in a variety of ways so that creating shapes goes on for hours. The idea is to figure out how many different ways you can link the robots while keeping them balanced. This enhances critical thinking skills and is a great beginner STEM exercise. It allows him to practice basic principles of physical science as he experiments with balancing and design configurations. Why he’ll flip: It’s so simple but allows him to be so creative. When it finally balances, he’ll be ecstatic. If he’s more into tractors than cars, this is the perfect toy to allow him to live out his fantasies. 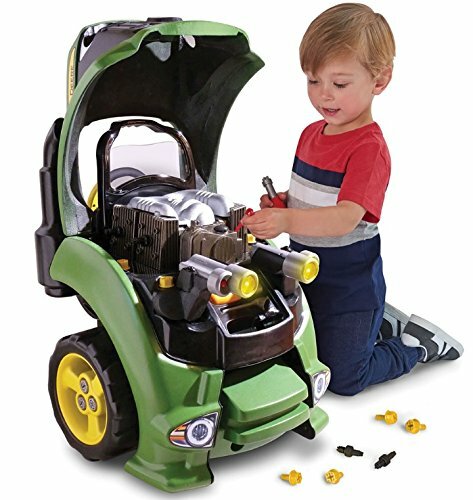 This is a licensed John Deere product and features a tractor engine piece standing at over 27” tall with multiple tinkering parts. He can service the engine with multiple removable parts, working lights, and realistic engine sounds. It’s a great piece for dramatic play and will have him tinkering for hours on end. Why he’ll flip: Tractors are cool, and this is his very own tractor to service just like a real mechanic. 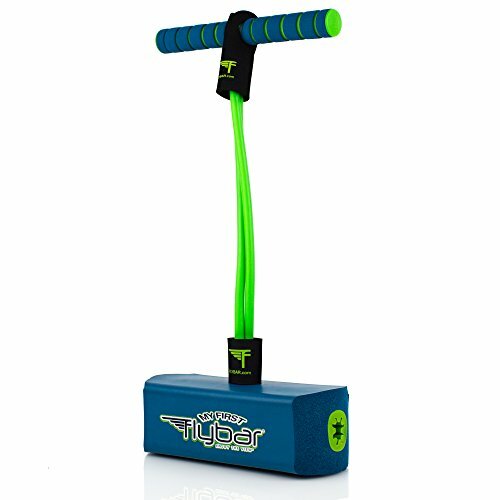 Pogo sticks are awesome, but unlike a real Pogo stick, My First Flybar is a foam block with a sider base to allow young kids to jump and balance more easily. It has a built-in squeaker to help count jumps and will keep your four-year-old boy busy for hours. 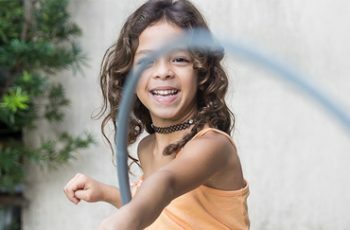 It’s important for kids to get enough exercise, but there isn’t always a way for them to do so. 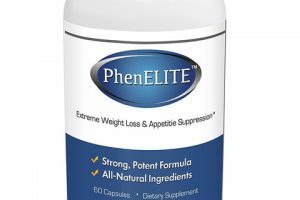 This is easy to master so that he can jump around for hours and wear out his energy. It helps him practice essential motor skills and bodily awareness including balance. Why he’ll flip: It’s just like a Pogo stick but without the frustrating learning curve. There’s nothing more fascinating for kids than space. This play tent is shaped like a rocket and will give him hours of fun pretending he’s traveling outside of earth. The rocket design and the star pattern offer hours of dramatic play fun. It has a sturdy, wireframe design and folds easily for transport. It can be used indoors or outside. It comes with a carrying bag for easy storage but is so lightweight that it can be moved without disassembling. It’s also easy to wipe-down after particularly messy playtimes. 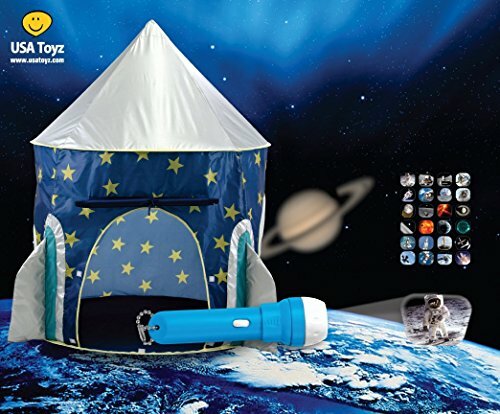 It also comes with a flashlight that projects images of space onto the walls of the tent for extra incentive to play. The piece has lenses that can be inserted to project different images of space onto any flat surface. Why he’ll flip: A rocket ship in his bedroom plus the coolest projector flashlight. He’ll be playing for hours. As his first microscope, he’ll be introduced to the micro-world through working lenses and a talking function. 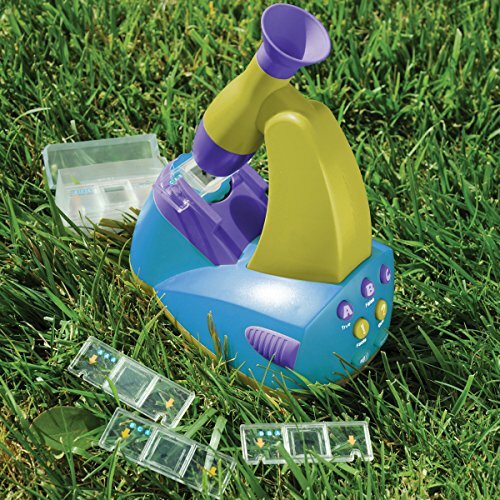 The microscope is sturdy for small fingers and is brightly colored for visual interest. It’s an award-winning STEM tool and encourages early interest in the field of science. It includes 12 slides plus quizzes to test his knowledge. It is a crucial STEM learning tool for the biological sciences and is a great way to introduce him to scientific inquiry. It’s easy to learn to use, and the knob is perfect for small fingers. He can also practice his motor skills as he learns to focus the lens. Why he’ll flip: What little boy wouldn’t want to examine the micro world of creepy crawlies? An excellent way to encourage imagination is through the use of hand puppets. 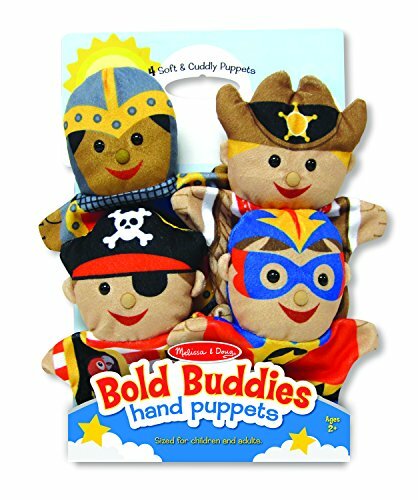 This Melissa and Doug set includes four familiar characters in children’s stories, a knight, pirate, sheriff, and superhero. He can create stories alone, or tell stories to friends and family. They are soft plush and easy to manipulate. The size fits both children’s hands and adults so everyone can get in on the story. 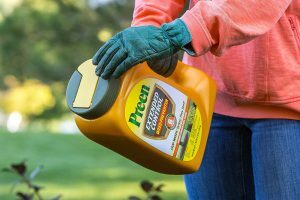 The fabric is washable, making cleanups easy. They encourage cuddles as comfort, but also imaginative stories for hours of fun. Why he’ll flip: These are the kinds of toys that offer endless possibilities. At this age, imaginative play is so essential that open-ended toys like this are essential pieces. Yo-ho! Yo-ho! A pirate’s life for me! 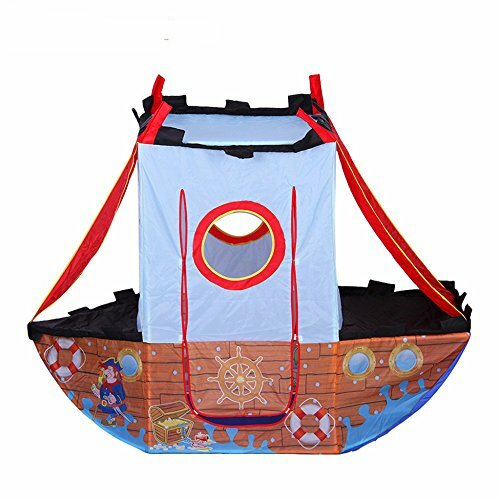 The pirate ship play tent is the dream of every little boy who wants to be on the swash-buckling high seas. It features a pirate ship design with a covered top, windows, and the pirate flag. Though it’s boat-shaped, it’s spacious. 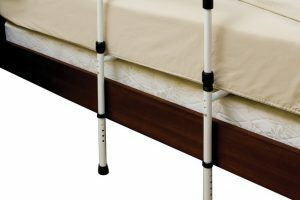 It features a sturdy wire frame that’s easy to disassemble when he’s ready to move on to something else. It also has a convenient carrying case for easy transport. It’s so lightweight that you don’t have to disassemble a thing if you just want a change of location. Why he’ll flip: It’s an actual pirate ship! It’s all his pirate dreams come true. This balancing stacking game is a brightly colored take on a familiar story. 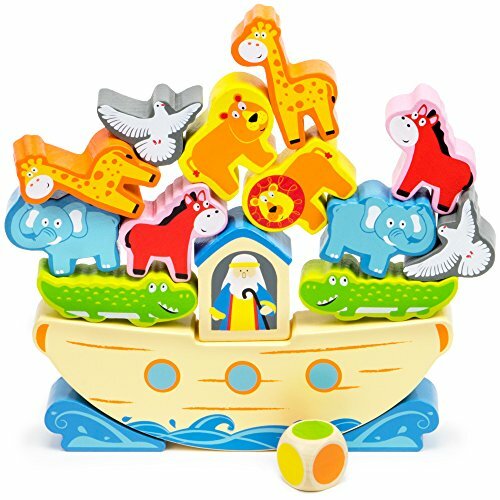 It features all your four-year-old’s favorite animals and requires critical thinking skills as he tries to stack the animals on the ship. You can play freely, or you can use the dice to stack the animal that matches the color thrown. Each player stacks an animal until the animals tumble off the ark. He can play again and again alone or with others to encourage social skills. It encourages dexterity, problem-solving skills, and fine motor skills as the animals are stacked and balanced. It’s made of wood with water-based paints so you can feel good about him playing with it for long periods of time without worrying about the effects paint will have on his health. Why he’ll flip: It’s a simple game with a simple premise. He can experiment and learn about results as he configures the stacks in different ways. When he’s done with the game, he can play with the animals.